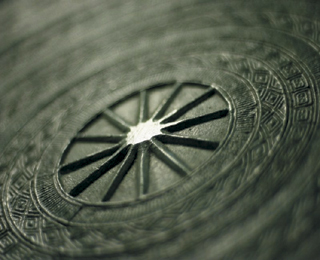 Many symbols can be found on rain drums. 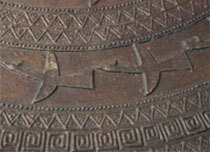 The tympanums (tops) of these drums often feature a star in relief, usually with eight points. 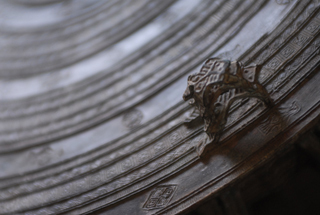 These points are often surrounded by a geometric display of other symbols. Sometimes twelve points are shown, as is the case in the image to the left, presumably representing the twelve lunar months of the year. 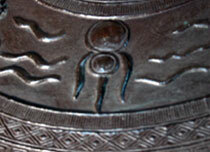 Bronze Frogs Detail Raindrum top	Ships, usually sailing counter-clockwise, are another common image. 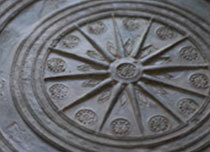 It is believed that this sailing direction represents the burial rites of some early mainland Asian groups. These drums sometimes show a naked steersman seated at the ship’s stern. This is believe to be the King of the Dead, who carried the souls of the deceased across the sky to the next world. 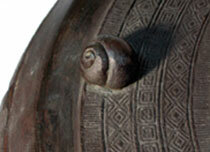 This pattern is consistent with the cultural traditions found in some parts of Indonesia. 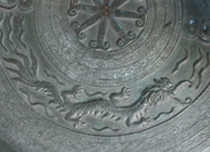 The associated drums often have tympanum suns with twelve points and ships with twelve sails. Some of these drums have been discovered in East Java and have contained human bones and earthly possessions. Other drums record simply the daily lives of the people who made them, including farming scenes, musical performances, religious ceremonies, and important people.